Union Minister of Road Transport, Highways and Shipping Sh. Nitin Gadkari has said that the construction of highways in the country has now gone up to 18 kms per day and the target is to increase it to 30 kms per day by the end of March this year. He was addressing the All India Regional Editors Conference in Jaipur today. 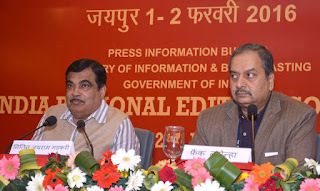 Shri Gadkari further said that he aims to create a capacity for construction of 100 kms highways per day in the country. He said that the target is to have over 1.5 lakh kms of road as national highways from the present 97,000 kms and this length may also go up to 1.75 lakh kms after discussions with the states. While giving details of new road works undertaken, Shri Gadkari said that most of the work of Delhi-Jaipur highway has been completed and remaining work will also be completed soon. He said work is being undertaken in Uttarakhand for construction of road for easy access to Kailash Mansarovar, for which machines have been procured from Australia. He added that in order to connect Kedarnath, Badrinath, Gangotri and Yamunotri in Uttarakhand, 900 Kms of road will be constructed with Rs 11,700 crore investment, and the work will be completed by the year 2020. The Minister also highlighted certain innovative steps planned in road construction, including use of plastic waste which can be mixed upto 7-8% in tar road construction. He said solid waste will be used while constructing new highway connecting Delhi and Meerut. He emphasised the use of cement and concrete in road construction with bitumen surfacing. Stating that with the increase in length, about 80% traffic will be on national highways, Shri Gadkari said that efforts will be on reducing accidents. He said Rs. 11,000 crore have been earmarked to fix the problem of 726 identified black spots. He added that the target is to reduce road accidents by 50% in the next five years. In order to address the issue of pollution Shri Gadkari underlined the need for using ethanol, bio-diesel, bio-CNG and electric vehicles for transportation. He also informed that the country will switch to BS VI emission norms from April, 2020. Shri Gadkari emphasised on development of waterways. He said that the National Waterways Bill, 2015 which has been passed by the Lok Sabha is likely to be moved for consideration of Rajya Sabha during the forthcoming Budget Session. With this the number of national waterways will go up to 111 including five existing national waterways. The Minister announced that a study for alignment and environmental impact has been undertaken for building a navigation canal from Kori Creek, Kutch to Jalore in Rajasthan. It will be completed by March, 2016. He added that study is also being undertaken to determine navigable stretches of Indira Gandhi canal. Shri Gadkari said that the Sagarmala Programme aims to promote port-led development in the country. He said a national perspective plan for comprehensive development of India’s coastline and maritime sector is under preparation. Stating that the emphasis is on modernisation, mechanisation and computerisation of ports, the Minister said the Government plans smart ports in the country where waste water will be fully recycled. Modern hospitals, engineering colleges and ITIs will also be opened at these places. He said that subsidies will be provided to fishermen groups to buy fishing trawlers. The Minister informed that on the Jal Marg Vikas, National Waterways -1: River Ganga, multimodal terminals are being developed at Varanasi, Sahibganj (Jharkhand) and Haldia. He said that the first phase of the River Information System between Haldia and Farakka has been inaugurated while in Phase II, stretch between Farakka and Patna and in Phase III, stretch between Patna and Varanasi will be covered.